127 mm/38 Mk30 mod. 05 х 1 pcs. 180 Degree Turn Time5.29 sec. 20 mm Oerlikon Mk47 х 1 pcs. 40 mm Bofors Mk13 х 2 pcs. 20 mm Oerlikon Mk202 х 2 pcs. 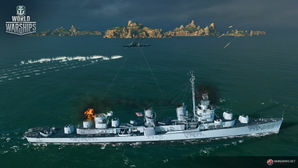 Black — American promo premium Tier IX destroyer. One of the numerous and very successful Fletcher-class destroyers which boasted a sufficiently high speed, powerful dual-purpose artillery, efficient AA defenses, and decent torpedo armament. Black was originally available by reaching Rank 1 in five (5) separate seasons of Ranked Battles. She is now sold exclusively via the Arsenal. Tier IX reward ship Black is very similar to her American tech tree counterpart Fletcher, with the main differences being her torpedoes and the availability of the Surveillance Radar ( ) consumable. Black is unique among American destroyers in that she can equip Surveillance Radar, though her radar is weaker than those available to most other Tier IX ships, featuring only 7.5 km range and 20 seconds of uptime. Despite the reduction in range and short duration, this radar — combined with five fast-firing American destroyer guns — still makes Black a fearsome ship when contesting control points, able to see through smoke to spot for her team and continue damaging enemy destroyers. The other major difference between Black and Fletcher is their torpedo armament. Black’s torpedoes feature a 13.7 km range and are rated for 21,600 damage, but travel at a painfully slow 43 knots. These torpedoes are almost more for area denial, as leading targets with them is almost impossible; they take longer to reach their max range than they do to reload. Note, however, that these torpedoes are harder to detect than most others found on Tier IX destroyers (0.9km detection radius), and adding the Torpedo Acceleration commander's skill to Black’s commander will likely result in more torpedo hits. There are some other minor differences between the sister ships — Black is slower and has a smidgeon less anti-aircraft firepower — but most important characteristics remain the same. Black brings a slightly different play style to the American destroyer family, and fans of Fletcher will find Black a great addition to their port. Same excellent concealment as the Fletcher. Very fast turret rotation speed. Very rapid rate of fire. Torpedoes hit very hard; they reload faster than Fletcher’s torpedoes, have more range than Fletcher’s torpedoes, and are difficult to detect. Has access to either Defensive AA Fire ( ) consumable or a unique Surveillance Radar ( ) consumable. Unlike Fletcher, Black is a premium ship so captain retraining is unnecessary. Same fragility as the Fletcher. Torpedoes are incredibly slow, slower than even Sims’ infamous "sea mines". Slow shell speed makes it difficult to hit targets from range. As a premium ship, Black doesn't have any upgrades to research. Captains with access to Surveillance Radar Modification 1 ( ) are strongly encouraged to equip it in Slot 2. The extra four seconds of active time may not sound like much, but access to Surveillance Radar ( ) is Black’s big strength, and she should maximize her use and effectiveness of it. The recommended option for Slot 6 is Main Battery Modification 3; Black is less flexible than Fletcher because her torpedo loadout is more challenging to use. Captains who grow comfortable with the slow speed of Black’s torpedoes may wish to experiment with Torpedo Tubes Modification 3 ( ) in conjunction with the Torpedo Armament Expertise and Torpedo Acceleration commander skills. Attempting such a build until captains are familiar with the quirks of her torpedo armament is not recommended. Though she has three options for Slot 3, the reason to take Black into a game (and not Fletcher) lies in equipping Surveillance Radar ( ). Captains are encouraged to equip premium versions of all consumables. As a Tier IX premium ship, Black comes included with Type 10 camouflage that lowers her detection radius, reduces the accuracy of incoming shells, reduces her repair costs, and increases the amount of experience she earns. This Type 10 camouflage provides a 100% bonus to experience earned in battle, not the usual 50%. Black launches a salvo of torpedoes while a friendly New Orleans opens fire. Black doing American destroyer things. Black detonates a full-health Montana with one lucky torpedo hit. USS Black (DD-666) underway during the early 1950's, probably soon after she was recommissioned in July 1951. The ship is still essentially in her late World War II configuration. As the first class of destroyers produced by a wartime United States, the Fletcher-class was seen as a logical progression from the pre-war designs. The design firm of Gibbs and Cox took their experience in designing the previous Benson and Gleaves classes and sought to rectify the deficiencies in both designs. Coming in above 1,500 tons, the previous designs failed to meet the armament requirement of five (5) 5-inch guns and ten (10) torpedo tubes; they were seen as too small and top heavy. History would prove their third creation to be a war-winner; the mettle and venerability of the Fletchers were displayed regularly during the grueling combat of the Pacific campaign in World War II. The Fletcher-class ships were the first destroyers in the US Navy to exceed 2,000 tons displacement. In a change from previous design practice, Fletchers had flush decks as opposed to the raised forecastle design seen on the Benson class. This increased her length but decreased her freeboard and improved her handling; overall, this was considered a very structurally sound and seaworthy design. An interesting design choice to note: early build Fletchers have the taller rounded-tower superstructure design – as seen on the in-game model for Fletcher – whereas late-build Fletchers (such as USS Kidd) had a superstructure that was lower in height with a flat-faced bridge. In order to maintain the 38 knot speed despite the increase in tonnage, new propulsion machinery was utilized: boilers that were 20-30% more efficient and turbines that were 20% more powerful than predecessors were installed. Ultimately, a third of the internal space was consumed by propulsion machinery in a unique configuration. The forward boiler and turbine room were separated from the rear boiler and engine room via watertight bulkheads. Each individual segment ran the port and starboard propulsion screws, respectively. This configuration resulted in greater machine survivability from combat damage. As required by U.S. Navy specifications, each Fletcher class ship was able to mount five (5) 5-inch guns in single, enclosed, dual-purpose mounts; two guns forward, two guns rear, and one amidships. All turrets were controlled by Mark 37 and Mark 22 fire directors. Feeding information to the gun computer, the main battery could all be remotely controlled if required. Furthermore, the class got to implement SG surface radar and "Variable-Time" proximity fuses — both novelties to the Navy — that allowed effective engagement of both surface and air threats. Learning from the experience of Pearl Harbor, the Navy decided to invest in heavier anti-aircraft armament. After seeing their effectiveness during the Spanish Civil War, the Navy's Bureau of Ordnance (BuOrd) arranged manufacturing licences for Oerlikon 20mm and Bofors 40mm cannons. Anti-aircraft armament was constantly being changed throughout the war; USS Black, for instance, was armed with four (4) 20mm and four (4) 40mm AA guns for most of her time in the Pacific. Finally, the class was able to mount ten (10) torpedoes in two quintuple-tube launchers amidships, the heaviest torpedo broadside of any U.S. Navy destroyer at the time. By also carrying depth charge launchers in conjunction with anti-submarine sonar, Fletchers were well-equipped to conduct anti-submarine operations as well. Overall, the class was armed with a plethora of tools to combat a myriad of threats. In light of the mounting ferocity and desperation of Japanese kamikaze attacks against US carrier strike groups late into the Pacific campaign, the Navy saw it fit to increase anti-aircraft potency in picket ships however possible. In 1945, about 55 Fletcher-class destroyers – such as USS Kidd – had their forward torpedo tubes removed to install an anti-aircraft platform mounting two quad-barrel 40mm. In addition to the three existing dual-barrel 40mm emplacements, the total was brought up to fourteen (14) 40mm AA guns. Furthermore, the seven (7) single-barrel 20mm were replaced with six dual-barrel emplacements, bringing the total up to twelve (12) 20mm AA guns. In the end, 175 Fletchers were produced from 11 shipyards throughout the United States. 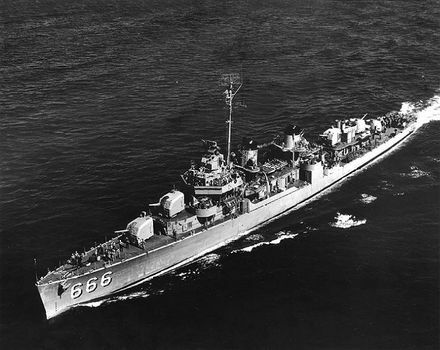 USS Black (DD-666) was the 138th Fletcher-class destroyer to be produced, named after Lieutenant Commander Hugh D. Black. Commander Black was killed in action as a result of the loss of USS Jacob Jones (DD-130, a Wickes-class destroyer) to a German U-boat off the New Jersey coast in 1942. With the sponsorship of Mrs. Black, Federal Shipbuilding and Dry Dock Co. in Kearny, New Jersey built the namesake destroyer and launched her on 28 March 1943. Following her completion and commissioning in 1943, USS Black headed for Pearl Harbor in preparation for her deployment into the Pacific Theatre. In late 1943, she sailed for Tarawa, where she remained until January 1944. USS Black did not see combat until February 1944, when she participated in the invasion of the Marshall Islands. Throughout 1944, USS Black participated in the battles of Saipan, Guam, and Leyte gulf, providing anti-air cover and assisting in shore bombardments. In late November, she returned to San Francisco for repairs. In February 1945, with her repairs complete, USS Black sailed to the Caroline Islands where she joined Task Force 58. The ship later participated in several coastal operations during the Battle of Okinawa. USS Black remained off the coast of Japan through early 1946 before again returning to the United States. The ship was decommissioned and placed in reserve in August 1946. Ship's emblem of USS Black (DD-666). Black underway in an unnamed Pacific harbor, May 1945. Black at sea (date unknown) following her mid-1950s modernization, in which she lost one 5"/38 gun mount and received three 3"/50 twin mounts. Black refueling from USS Eldorado (AGC-11), 14 November 1960. USS Tolovana (AO-64) refueling Black and USS Franklin D. Roosevelt (CVA-42) in the Gulf of Tonkin, 12 September 1966. Black patrolling the Gulf of Tonkin, as seen from the deck of USS Intrepid (CVA-11), circa 1966 or 1967. Black at sea, circa 1968. This page was last modified on 4 January 2019, at 22:16. This page has been accessed 69,346 times.